This is the coconut milk I used for this ice cream. It may not be ideal but I had one can on hand and decided to make a small, half-batch, of coconut milk ice cream using it. Just warm the coconut milk up in a pan and stir in 1/4 cup of sugar until dissolved and add a touch of vanilla extract (which makes everything better). As you can see, it's not a lot of extra sugar and I thought it was just the right amount even though more sugar in an ice cream recipe would help give it a softer texture. If you use superfine sugar, you could probably dissolve the sugar without even heating up the mixture. And instead of sugar, Kelly says you can use honey but I wanted the full-on flavor of the coconut milk to shine without interference so I opted for basic sugar. Chill this mixture and then churn it in your ice cream maker, keeping an eye on it so that it doesn't over-churn (particularly if making a half-recipe like me). You end up with coconut milk in ice cream form. After it sits in the freezer, the ice cream becomes quite hard, in my experience, so let it sit at room temperature for a bit before scooping. The texture may seem very icy after it's been in the freezer but is actually very creamy in your mouth. As for the wonton crisps, I adapted Martha's recipe. You just lay wonton wrappers on a lined baking sheet (you could cut each into 2 triangles if you want smaller crisps) and cover them with an egg wash. I didn't have cream on hand so I used an egg yolk with a bit of milk. Then sprinkle over some sesame seeds and a little sugar. It took about 12-14 minutes for mine to brown and crisp up fully in a 350 degree oven. Since the sides curled up a bit, I had the notion of using them to hold the ice cream like a plate or little bowl. They are very easy to make and a fun little adornment for ice cream like this, or for sorbets. You could even skip the sugar and make these sesame wonton crisps into a savory snack or accompaniment. Place all ingredients in a saucepan over medium-low heat. Stir until sugar is completely dissolved. Let cool and chill before churning in an ice cream maker, according to manufacturer's instructions. Transfer ice cream to a freezer-safe container and freeze for at least 2 hours before serving. Serve with sesame wonton crisps (recipe below), if desired. Place wonton wrappers on a lined baking sheet. Preheat oven to 350 degrees. Make an egg wash by whisking the egg yolk and milk together. Brush egg wash over each wonton wrapper, sprinkle each with 1/2 teaspoon of sesame seeds, and about 1/8 teaspoon of sugar. Bake until golden and crisp, roughly 10 to 12 minutes or so. Let cool completely on a wire rack. Serve with coconut milk ice cream (above) or other ice cream/sorbet of your choice. Just 3 ingredients!! wow It surely looks really creamy and smooth. Fun to serve it over the crisp sesame wonton skin. I love coconut and coconut milk - this ice cream looks phenomenal! I actually just recently made some too but it's the no churn kind (recipe to be posted in a few weeks). This one here is the real deal - and I wish I had scoop of it right now! I think I'm coming around to coconut itself. I might have had one too many way-too-sweet coconut macaroon type cookies as a kid and keep associating that with coconut...but I do love, love coconut milk. 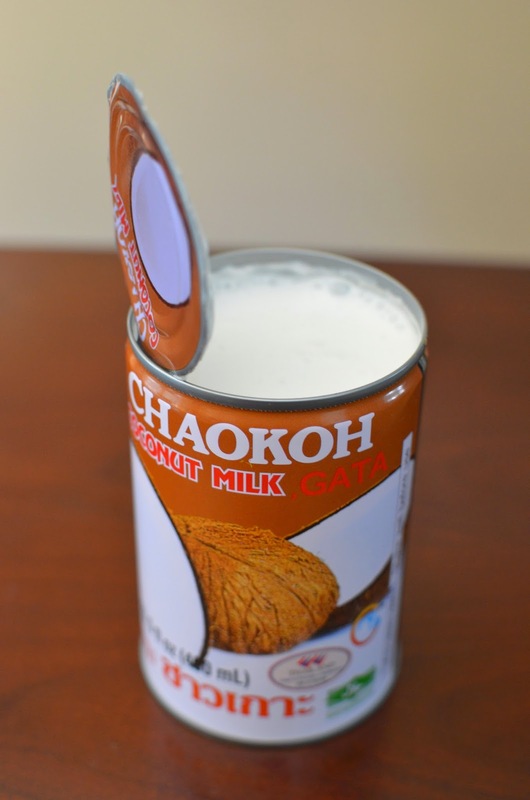 This is pure coconut milk yummy-ness! What a beautiful and delicious treat! I want to make (and eat) all the ice cream I can before it gets cold around here! Thanks for all the help and for the recipe, Kelly! So much fun and that pure coconut milk flavor is so divine. Eating it straight out of the ice cream maker is a very good option, I think...otherwise, I don't think planning a little ahead to let it soften is a big distress. Happy ice-cream making & eating. Thanks again!! Love the simple ingredients!! I'm really into making ice cream at home lately. I couldn't resist the simplicity either, Ashley! I am absolutely drooling! Love, love, love this recipe. And the crisps are brilliant! Sugar and sesame - I've gotta try it! HI Monica, what a incredible recipe, love the sesame wontons, genius idea!! Thanks, Cheri. Have a great week! I adore coconut milk ice cream and this looks unreal! Adore! This looks amazing and I can't wait to try it. I love coconut milk ice cream so now I have to try making my own. And the crunchy wonton chips also look wonderful with it. It's was a fun little experiment. Thanks, Marie. This is so creative --- I would love those crisps on a cheese plate, too, maybe subbing out the sugar for some Parmesan! Absolutely, Sue. I think I could easily have skipped the sugar altogether (I used very little) and it would definitely be a savory snack. Love the idea of this ice cream on the crisps! I'd eat everything in this post.. all of it! Major yum moment! Thank you, Pamela. My husband just polished off what we had left of it. 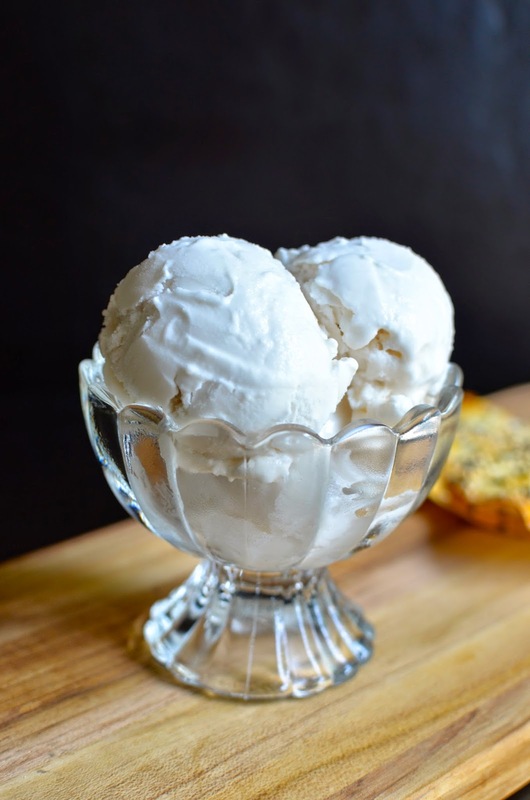 I love this recipe for the coconut ice cream, and yes, cannot go wrong with only 3 ingredients...and the the sesame wonton sure look tasty...thanks for the recipes Monica! Thanks, Juliana. It was definitely worth trying! This ice cream looks absolutely delicious. I love how creamy it is and those sesame wontons look like the perfect accompaniment! haha - I totally did away with the spoon and used the crisps to dig right in myself! I wonder the same thing...since coconut milk is so high in fat, right? Kelly mentioned that the brand of coconut milk could possibly affect the outcome. I'm not sure if it's the sugar content difference or what! But leave it sitting out a good 15 mins and it's soft enough to scoop, even if it isn't absolutely creamy. Thanks for the kind words, friend! You know these delicious flavours are 'right up my street' Monica!! Gorgeous! I can just imagine the aroma, taste and texture of the ice cream with the wontons. I will have to get my new machine out and give it a try - so great just three ingredients. By the way, I have nominated you for a Leibster. Not you if you have done it before but I thought I'd give you the opportunity if you wanted to join in the fun. Really no worries if you don't fancy it. Have a great Labor Day weekend! Thank you, thank you, Jo. You are so sweet, seriously! I've never had wonton crisps with ice cream! That sounds wonderful. I'm a huge lover of coconut milk so I am sure I would enjoy this ice cream. Yum! I think I need to start a pinterest board just for coconut milk recipes! I am amazed constantly at the many delicious ways it can be used and I love the flavor! I have never used wonton wrappers for anything except wontons/dumplings. I can't wait to try these crisps, sweet like you have them here or savory to serve with soup! haha - coconut milk is a little big magical to me. The wonton crisps work nicely in the oven...let it cool til nice and crispy. I love your idea to do savory with soup! The ice cream looks really creamy! That sesame crisp is such a smart idea! Add some crunch to soft ice cream. Beautifully done! It's got a very creamy, tasty mouthfeel. As I mentioned, mine froze super hard. You need to let it warm up at room temp a good 15 mins or so for it to be more easily scoop-able. This looks so simple to make and yet so delicious! I use the same brand of coconut milk. For desserts as well as my Indian curries that require it. Love it! I have pretty much always used that brand and I hear a lot of professionals recommend it. The only exception is I also like Trader Joe's light coconut milk if I want to go the light route.